This isn't technically stuffing, it's called "dressing" since it wasn't cooked inside a turkey...but I'm going to call it stuffing because it's easier. It's vegetarian too! And looks like a cupcake!!! 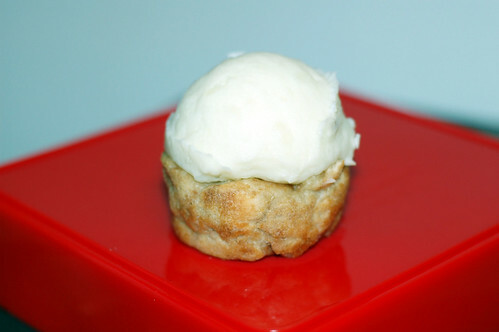 I baked it in a cupcake tin and then topped it with some mashed potatoes. It's really perfect for Thanksgiving coming up or any dinner. It's easy to eat, compact, and gets two of your side dishes together. You could garnish it with chives or (vegetarian) bacon or just leave it as is like I did. It's super easy to make and is an easy way to impress your guests. I prefer using an ice cream scoop to top it off but you could pipe the mashed potatoes. You can use any kind of stuffing/dressing recipe and mashed potato recipe if you have your own favorite, my family stuffing recipe is really simple, it's vegetarian, and it's delicious. If you aren't vegetarian and would like to use broth, you can replace the water with equal parts of Chicken Broth, which is what the original recipe called for (and how I ate it before I became a vegetarian), but being a vegetarian I just use water and it still comes out tasting great. Preheat oven to 350°F and butter a muffin tin (or an 8" square pan). 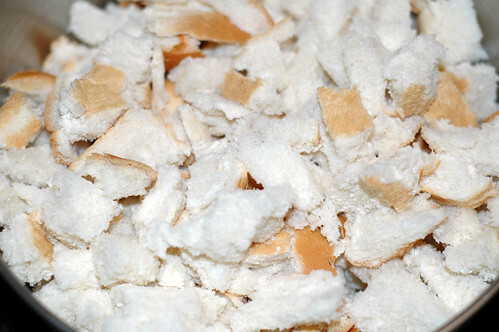 In a large bowl, mix together the bread cubes, water, and applesauce. Everything should be moist but not soggy, you can add a little more applesauce or water if it isn't moist enough. Mix in the salts and pepper and mix until combined, adding more to taste. Fill up muffin tin holes to the top (since they won't rise) and bake for about 35 minutes, or until the tops are slightly browned. Cover the tops with parchment paper and foil if you want a softer top, leave it uncovered for a more crisp top. Allow to cool slightly in pan, top with mashed potatoes, and serve warm. Boil potatoes until they can be easily pierced with a fork. 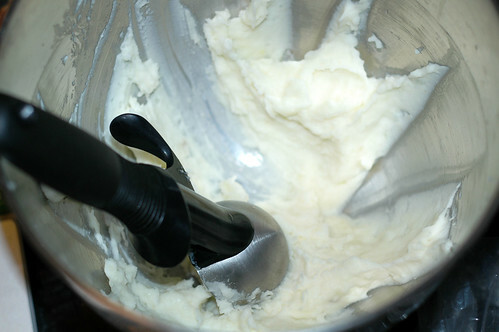 Drain the water and move the potatoes to another bowl (or stand mixer) and beat with an electric mixer (or stand mixer) with the butter and cream until fluffy. Add salts to taste, or you could add cheese or anything else you like in your mashed potatoes. 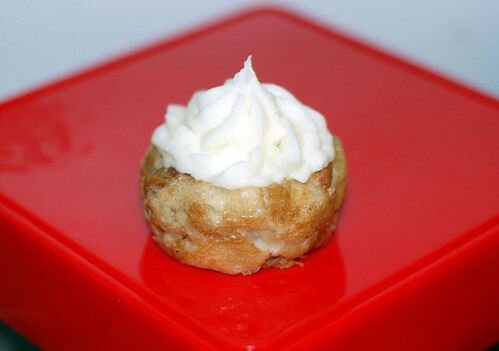 Use an ice cream scoop to put a heaping spoonful of mashed potatoes on each stuffing cupcake or use a piping bag and tip to make a nice design. Add garnish or gravy and serve warm.